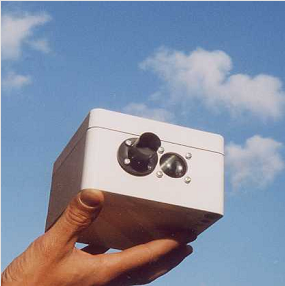 The Air eye is a compact low cost Present Weather sensor which uses optical backscatter technique for analysing water particles of different forms - like fog, rain or snow - in the air. The sensor has analogue and digital RS232 outputs giving the information about precipitation and visibility in "meteorological" terms like mm/hour and MOR. visibility - the density of fog particles in a zone near the sensor is measured by the Air Eye. The fog density is presented the so called extinction and as visibility in meters MOR. type of precipitation - (i. e.) rain or snow. Liquid and frozen precipitation are reported separately. Information is also provided regarding the type of rain by the size of the raindrops. The difference in this respect between the rain from a warm front and a shower is for instance detected by the sensor. rain rate in mm/hour - the output from the sensor is given as the detected amount of rain during the last 60 seconds in 1/1000 of a mm ( = µm ) which is easy to convert to mm/hour, simply by multiplication with a factor of .06. The typical accuracy is of the order ± 30%, somewhat less than a good "tipping bucket"- type sensor - but OK for many purposes like road weather monitoring. The rate of snowfall is also given in mm/hour. ambient light - uncalibrated measure of the ambient light, useable for things like checking if sunshine or not or day or night. laser power - a measure of the laser power for checking the laser function. faster response - no waiting until the "bucket" is full. Update every 2 minutes. 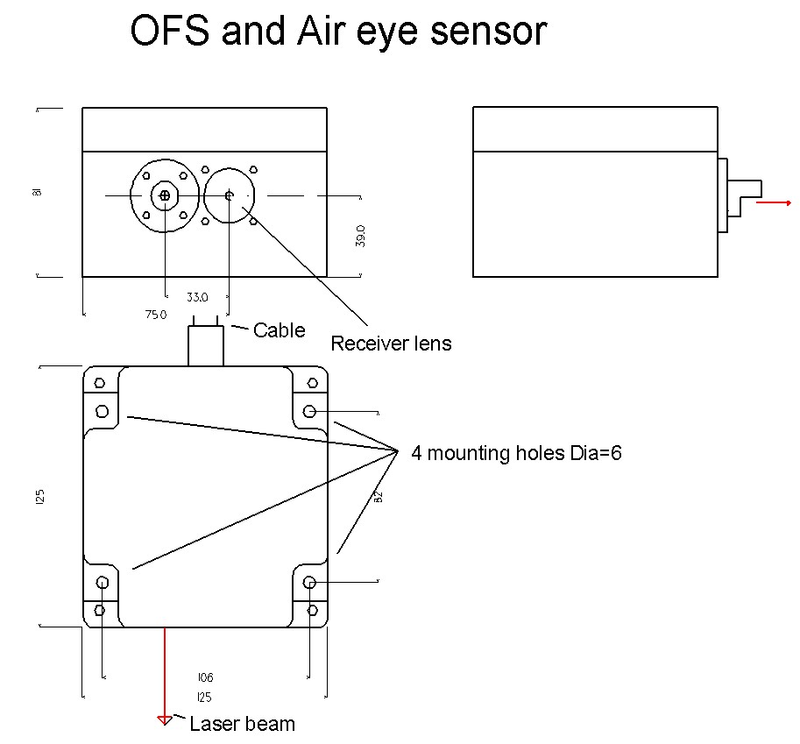 lower detection limit- the detection limit of the Air Eye is set by the software. In practice it is about ten times lower than that of a tipping bucket sensor, and that corresponds very well with what is experienced as rain. see when the rain really started and to follow the fluctuations in intensity. Air Eye distinguishes rain from snow. Many "tipping buckets" don't detect snow at all. air Eye is much more compact - the weight is approximately 1 kg the power needed for keeping optics dry is therefore much lower. The sensitivity for vibrations for instance in wind turbines is much less because of the compact design. The sensor is equipped with a membrane ventilator preventing from water intrusion because of under pressure during sudden temp decrease. This figure is a "screenshot" from a presentation of the data from an Air eye . At this occasion there was a warm front passage. 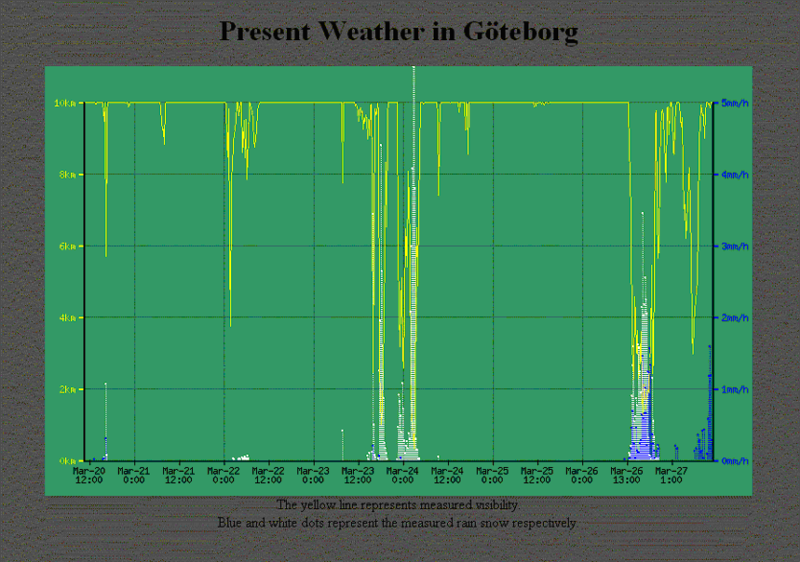 As can be seen the sensor detected both rain, snow and poor visibility (fog) during this period. Real time data from Air eye can be seen here. 1. A LASER radiation source. The LASER is a visible semiconductor laser, which generates a narrow, amplitude modulated collimated beam. 2. An optical receiver consisting of a lens, a detector and a phase locked amplifier. A narrow beam of red laser light from the laser source comes out of an opening on the front. The receiver behind a second opening is sensitive for incoming light in a narrow lobe that overlaps the beam. - the "sensitive zone". A comparison between the backscatter technique and an often used method - the forward scattering method - can be seen here. As an option the microprocessor also controls a potential free semiconductor switch that is opened when the calculated visibility is below a certain value (default is 1000 meters). And the switch is closed when the visibility is higher than that value. The unit should be mounted so that the laser beam is directed approximately north (on the southern hemisphere south) and horizontal, i e sunlight must not reach the detector. Note the channels with mounting holes for M5 bolts in the box, see drawing. The beam should not hit anything within a distance of about 10 meters. A floating linear DC 11-15 Volt ( nominal 12 Volt) , min 300 mA power supply is connected on the 2-terminal marked plus and minus on the screen print. Note that a floating linear i e not swithed power supply should be used. If there are particles in the sensitive zone light will be scattered back and reach the detector (backscatter) causing a signal on the sensor output. The sensitive zone is located about 30 cm ahead of the sensor and its volume is small - less than 1 cubic centimetre. The backscattered light contains information about precipitation and fog particles in the air. Fog causes a DC signal and falling particles (i e rain snow or hail) cause pulses as they pass the beam. More information about the measuring priciples can be found on Measuring visibility. The DC level is thus a measure of the reduction in visibility. The raw DC signal is converted to visibility in meters by a built-in microcomputer. Some pulse parameters are measured in the sensor and information regarding the shape of the particle is achieved. Small raindrops cause longer pulses than larger ones because of their lower fall velocity and snow cause even longer voltage pulses. The analog primary information is processed in a microcomputer that derives different information like visibility and amount of rain and type of precipitation, i e frozen or liquid etc. The integrated microprocessor analyses the data from the last 60 seconds, which is the update period. The results are transmitted as digital information - on an RS 232 line, "streaming" - and as analog 0-5 Volt voltages. Polling of data can also beoffered. The digital information is presented in form as a comma separated ASCII string on the RS232 output, 2400 (or 1200 baud on request) 8N1, that is transmitted "streaming" every 60 seconds.. This string can be received by many loggers with RS232 inputs but also by a PC with a terminal program like Hyper Terminal (part of WINDOWS). The second is the measured visibility in meters if the measured visibility is larger than 10000 meter 10000 meter is displayed.